I can only say this now, as someone who is already done shopping and doesn’t have to go out into the traffic and crowds that are undoubtedly swarming the malls as we speak. I would not love shopping if I did. I think that I like Holiday shopping so much because it is shopping with a purpose. I have a list of stores to hit, presents to buy, coupons to use and an order to do it all in. That kind of organized shopping makes me very happy. Something else that makes me happy? Unexpectedly finding myself a little present. I know it’s generally frowned upon to buy yourself stuff when you are supposed to be shopping for others, but I couldn’t resist. I was at TJ Maxx (yes, I’m a Maxxinista), and I was filling my cart full of ½ price cologne (I smell it at Nordy’s then buy it at TJ Maxx) and new kitchen bowls when I passed the “reduced” rack that they place out in the middle of the aisle. Of course I couldn’t pass the reduced rack without taking a peek. That makes the shopping Gods mad, and I wouldn't want to do that. It was my lucky day- the Gods were smiling on me. 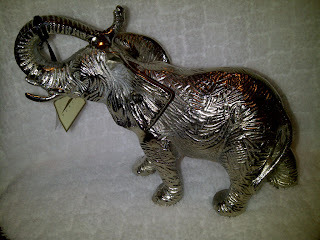 Placed on the top of the rack was this regal looking silver metal elephant. For $16.99 he was a bit of an investment, but I knew I loved him at least $20 worth so I carefully placed him in my basket (wouldn’t want to scratch him). I knew Chris might not be so keen on him, but I crossed my fingers that he wouldn’t mind a large silver elephant taking up residence at our house. I proudly brought Edward-the-elephant home and placed him on the dining room table, so Chris would see him right away. I didn’t want to drag out my affair with Edward if Chris vetoed him right away. Lucky for me, I caught Chris on an elephant-friendly night. He said I could keep him as long as he didn’t live on the main floor (or in our bedroom). Win! That left me with the basement - no way, it’s much too scary down there for an elephant, the upstairs bathroom- I didn’t think he would do good with the humidity, the sewing room- I think elephants are allergic to burlap, or the guest bedroom- what guest doesn’t love an elephant watching them while they sleep? I promptly took Edward to the guest bedroom his bedroom and got him situated. Every time I walk past the guest room, I see Edward standing proudly and I smile. I feel like an elephant in the house is lucky. Or maybe it’s a good omen. Or maybe it means nothing. But either way it makes me happy. Oh, and I’ve already changed his name. No idea why I’m naming things these days, maybe it’s our lack of dog that is making me turn inanimate objects into my friends. 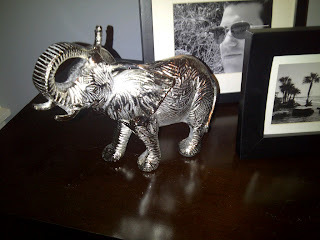 I was getting dressed over the weekend and totally called the elephant “Ellie.” Not out loud or anything- in my head. I’m not crazy. So now I’m having an internal struggle to determine if I think my new friend is a boy named Edward or a girl named Ellie. I am now realizing the Twilight implications of the name Edward and leaning heavily toward Ellie. On the other hand, I could go on a hunt for a lady elephant to name Bella, and then I would have a cute elephant couple living in my guest room, which would be kind of hilarious (at least to me). I would kind of love to tell guests who stay at our house that they are going to be sharing a room with Edward and Bella. I’m giggling just thinking about it. Doesn’t it make you want to come stay at my house?